Saving you money. Saving the Planet. Note: Thermal imaging camera is widely used in determining the air tightness of the house and the condition of it’s insulation by allowing one to see variations in temperature. When the exterior of the house is viewed through a thermal imaging camera, it is easy to see the locations where the warm air is escaping the house and how severe the air leaks are. Will determine if you need insulation, how much and what kind. STEP 2: HOME ENERGY SOLUTIONS (HES) is required in order to qualify for the generous $1 sq. ft. rebate. We will arrange a visit for you as part of our service. Insulation in the attic, basement and exterior walls is vital to making your home more energy efficient and comfortable. Interior wall insulation can absorb sounds, reducing unwanted noise from both the outside and interior sources. The energy savings and increased health and comfort benefits will make your home more attractive to potential buyers. Contact us for your no-cost Insulation Assessment. The better insulated your home is, the less heat is necessary to keep your house warm in the winter, and your AC will not have to work as hard to keep your house cool in the summer. The less your heating and cooling systems are involved, the less fossil fuels and other types of energy are used (not to mention, your HVAC equipment will lasts longer). The less energy we use, the more money we save the cleaner air we breath, the cleaner water we drink. The more comfortable our homes are, the more money we have the cleaner environment we live in – the happier (and smarter) we are. And all it takes – a one time insulation upgrade that’s beneficial in so many ways for many years to come. R-Value is a measurement of the effectiveness of insulation. It measures the thermal resistance. Different types of insulation have inherent different R-Values. The higher the R-Value, the better the insulation’s effectiveness for your home. GreenFiber Insulation fibers have a natural property of reversibly binding moisture vapor. Moisture vapor in the air is absorbed and released depending upon the relative humidity of the surrounding air. 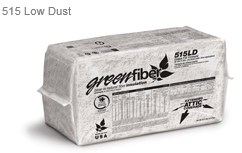 GreenFiber Insulation has a Noise Reduction Coefficient of 0.90 (90% of sound energy absorbed). It is so effective at keeping outside noises out, that it is used as an enhanced sound control material for homes located in airport flight paths! GreenFiber Insulation is made from 85% recycled paper fiber, reducing landfill waste. Each 40 sq. ft. bag contains the equivalent of about 46 Sunday newspapers. It is processed by electrically-driven mills that consume relatively little energy when operating, and which can be shut down completely at the end of the production day. This lowers energy consumption, allowing GreenFiber to manufacture to meet customer demand. Knauf EcoBatt™ Insulation doesn’t look like any insulation you’ve ever seen, but that’s because its natural brown color represents a level of sustainability never before achieved. Made from rapidly renewable organic materials, EcoBatt Insulation combines sand, one of the world’s most abundant and renewable resources, contains a minimum of 61.9% post-consumer recycled bottle glass and ECOSE Technology to create the next generation of sustainable insulation with excellent insulating value. EcoBatt Insulation contains no phenol, formaldehyde, acrylics or artificial colors. The EcoBatt is certified by UL Environment for indoor air quality (IAQ) as low emitting product. It does not support microbial growth or attract insects or vermin. In addition to being classified as mold resistant by GREENGUARD, EcoBatt Insulation has passed exhaustive entomological testing at leading institutions in the US and UK.